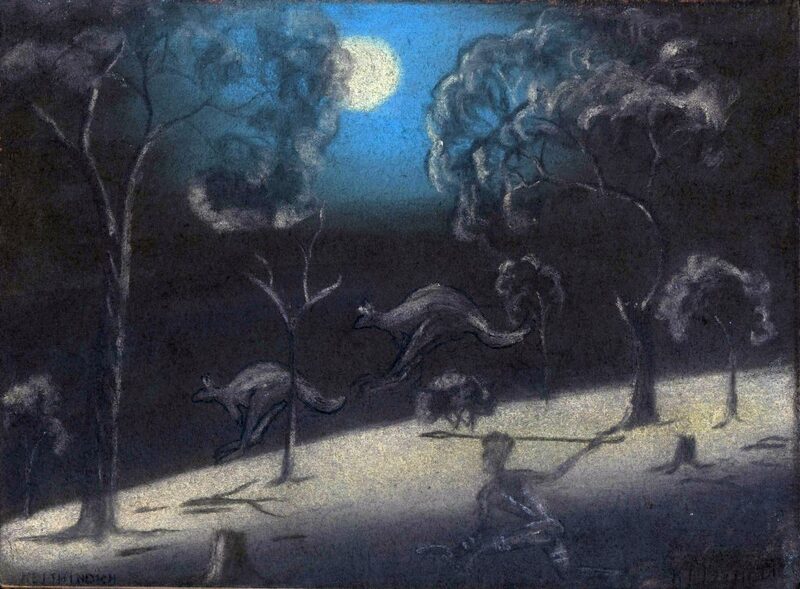 A pastel drawing, 28.5 x 22cm, by Keith Indich from one of his government-issued schoolbooks. The Myrtle K Benn Collection, 1947. On 21st March 2019, John Stanton and I, along with my close friend Mike Scott, travelled down to Kojonup to meet local farmer and long-term shire councillor John Benn at The Kodja Place. Mike and I, along with filmmaker friend Phil Strachan, had first met John two years ago (almost to the day). We had been shown around The Kodja Place, which is well worth a visit, and we then spent time together at Carrolup and at John’s farm nearby. John Stanton and I then met John (and his colleagues Glenys Russell and Craig McVee) in Kojonup last November on our way back from Albany. John Benn’s mother, Mrytle Benn, was a teacher and landscape artist living in Kojonup. She had taken her son and his fellow pupils to Carrolup in 1947 and again in 1948. John was seven and eight years old at the time. He and his friends knew next to nothing about Aboriginal people. As their old bus approached Carrolup Native Settlement, the children became scared that spears would be thrown through the open windows. John remembers entering the main schoolroom and seeing half a dozen or so young Aboriginal boys working on their drawings at a large table. They were using broken crayons taken from a pile in the middle of the table. As the boys worked, they were quiet and completely focused on the task at hand—their art. The Kojonup schoolchildren stood around and watched. Afterwards, Aboriginal and non-Aboriginal children walked around the Native Settlement together. Most likely during the first of these visits (1947), John’s mother was given by Carrolup teacher Noel White three government-issued school pastel drawing books belonging to Keith Indich, Dulcie Penny and Edith Wallam. She later passed on these books to her son. John Stanton very carefully scanned the various pages of the schoolbooks whilst we were there at The Kodja Place last week, so that John Benn and ourselves would have copies for showing to others. John S also filmed John B! Whilst the scanning was taking place, I had a very interesting chat with Noongar Elder Jack Cox, who had taken us on a tour at The Kodja Place two years earlier. Jack mentioned that he had been too old to go to Carrolup. He paused and then said that three of his younger brothers had been there. Excitedly, I rushed over to my computer and checked through copies of some of the documents I have in my possession. I found three names—M. 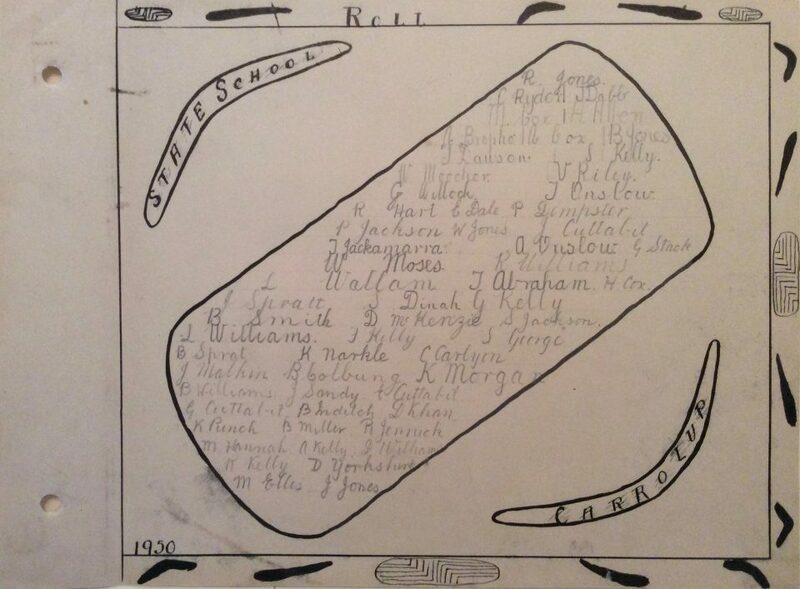 Cox, A. Cox and H. Cox—on the ‘Roll’ page of a 1950 booklet of the children’s work which had been presented to the Department of Education Inspector Charlie Cook. Jack said they would be his brothers Michael, Arnold and Harold. I was thrilled at hearing this and asked the women working at The Kodja Centre if they could print off copies of four photographs I have from Noelene White, Noel White’s daughter, in case Jack could recognise his brothers. He pointed out some boys as potential ‘candidates; but wasn’t completely sure. We’re talking about identifying children from 69 years ago! He said he would show the photographs to two of his brothers—one has passed away—when they next visited him. I truly hope we are able to connect his brothers with their earlier selves in the photographs. I’d like to finish this blog by encouraging those of you in the South West of Western Australia (and visitors to this region) to visit The Kodja Place in Kojonup. It’s a great example of Noongar people and members of the settler communities coming together in collaboration to create something very special. It is their reconciliation experience.